PHILADELPHIA—Amid the wreckage that was the Eagles 24-20 loss to the Arizona Cardinals, there was the outstanding performance by wide receiver Jeremy Maclin. Lost in all the talk of safety Nate Allen getting burned on Carson Palmer’s game-winning 75-yard touchdown pass to John Brown, Maclin caught 12 passes for a career-high 187 yards and two touchdowns. Even bigger than his numbers was the versatility that Maclin showed as a receiver on the passes he caught from quarterback Nick Foles. Maclin caught passes across the middle, on corner routes, screen passes and on deep routes. “He’s a legitimate deep threat and he played a hell of a game for us (Sunday),” Eagles head coach Chip Kelly said. To his credit, Maclin was more concerned about his team being on the short-end of a heartbreaking loss than his own individual performance. “I’ve never been a stat guy… Today was just one of those days where my number was called. The win would be so much sweeter,” Maclin said. The two touchdowns Maclin scored should tell you that he is more than a one-trick pony as a wide receiver. On his first score, Maclin used his speed on a flanker screen that enabled him to score on a 21-yard touchdown pass. Late in the third quarter, the former Missouri star caught a 54-yard bomb for a score. “Mac did a great job of keeping his route on and really just beating them with speed. I just wanted to get the ball out there and let him come down with it. He had a great game,” Foles said. Maclin leads the team in receptions with 39 and receiving yards with 632 (ninth in the NFL)and six touchdowns. He is averaging 16 yards per catch. Kelly said he’s not surprised by Maclin’s performance so far this season. He said he was looking for him to do this last season before he injured his knee during training camp and was out for the year. For those Eagles fans still whining over the loss of DeSean Jackson, now playing for Washington, you need to be happy with what you have at the receiver position with Maclin because it’s not just about stretching defenses with his speed, he is a better route-runner and is not shy about going across the middle. While Jackson’s speed did a good job of stretching opposing defenses last season, he was basically a one-trick pony who is not as good a route runner as Maclin and not as versatile. You’re not going to see Jackson, who leads the NFL in yards per catch, running across the middle to get passes. Maclin also showed he had some heart in Sunday’s game. After a collision with Cardinals cornerback Patrick Peterson, Maclin was nursing a bloody ear and had to go through the concussion protocols before he was allowed back in the game. 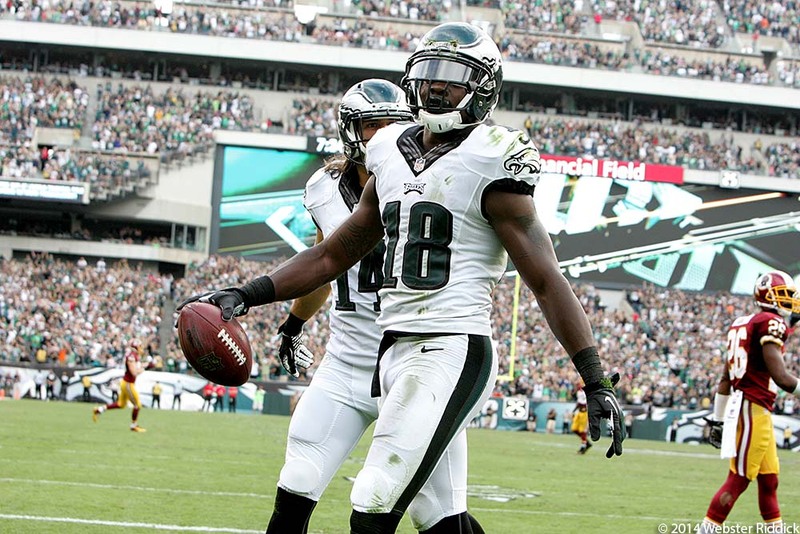 Throughout Sunday’s game, Maclin was all over the place hustling and making plays for his team. On one play after an incomplete pass he came barreling through the Arizona sideline knocking down the Gatorade table and getting doused with the beverage. I don’t think Maclin’s speed is as explosive as Jackson’s, but I think Maclin so far this season is proving that he can do more than just go long. He can do it all. With all the weapons in the Eagles arsenal on offense, Maclin is slowly but steadily becoming the Eagles go-to guy in the passing game.